The buttons caught my eye almost immediately. I inspected the uniforms minutely once I was assigned them as my object for this project, but there seemed to be so little to them. The clothes are of simple and practical design, as one would expect. They’re not particularly comfortable looking but seem well made and warm. According to the Museum, the children’s uniforms were designed to resemble their adult stations in life, so the girls’ resembled domestic servants and the boys’ sailor uniforms. There was this one, single detail visible on the boys’ uniforms – bright buttons embossed with lambs, the symbol of the Foundling Hospital. I couldn’t let go of the image of those buttons. I imagine that the children didn’t have much, if any time to be children in their regimented lives, designed to turn them into upstanding, self-reliant citizens. A disciplined life was a much better option than their likely future if their mothers hadn’t given them up. That future would have meant a life of destitution, assuming they lived past infancy at all. These children were so very lucky in the context of their time – no Oliver Twists here. But those buttons. I couldn’t help but imagine this sole adornment maybe, hopefully, causing a moment of fun, imagination and play. 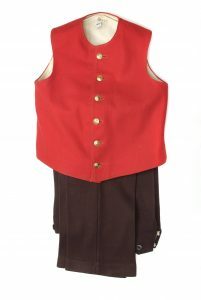 For just a moment when pulling on a jacket or waistcoat, a foundling could take a moment to be a child. So much about the foundlings is unknown both their histories and their future lives but we do know children are naturally full of curiosity and an instinct to play. I also played around with thoughts of identity, a theme that doesn’t take long to settle on anyone’s shoulders during a stroll around the Foundling Museum. The Hospital was founded at a time when most people’s roles in life were determined by the circumstances of birth and background. The foundling uniforms not only marked their status at the hospital but also foreshadowed their largely fixed future paths. And here we are now, in a world where we have multiple identities and live in the age of the (shudder) selfie stick. I have at least 3 email addresses that I use for different activities, two mobile phones, one for work and one for play, and I’ve lost count of the number of social media accounts I have. Whether we like it or not, to the wider world we are the sum of our external, searchable selves. We curate our lives on different platforms and compartmentalise our contacts, followers and friends. All this connectivity also opens up worlds of possibilities for us to explore whole new identities of our own, meet people we might never have met and to stay in touch with those who may otherwise have disappeared from our lives. Although records were kept, the foundlings themselves didn’t know their own birth names, let alone their own history. Their futures were mapped out for them and their daily lives were strictly controlled. What was their sense of self? How did it feel to put on that uniform, day after day? Not even a uniform of one’s own, with a name sewn into the collar, just another item that was part of the general pool of items. The garments were allegedly designed by Hogarth himself, although that fact is unproven, so even the very identity of the uniform’s designer is lost. This process has centred around unanswered questions. Two emotions take over when I think about the Foundling Museum, feelings I’m sure I’m not alone in experiencing; bottomless sadness at the thought of the desperation mothers must have felt to have to leave their children in the hands of strangers and immense gratitude at the reminder that there have always been people in the world like Foundling Hospital founder Thomas Coram, a man who would not accept the status quo and was prepared to fight to change it. Those buttons will live on in my mind. Although they are part of a uniform worn by thousands of little boys without a history, I hope the gleaming lambs brought a moment of dreaming, a moment of fun to an otherwise ordered and rigorous life. Stand to attention, no fidgets. Shirt tucking, button fumbling – ah! dancing on buttons along this coat.